Today VoIP Innovations released a great new feature in their BackOffice that allows customers to better organize their DIDs. VoIP Innovations customers are made up of resellers who buy their services, bundle them up, and sell them to end users. Their end users could be businesses like hair salons or machine shops. Each reseller has multiple end users which means they could have thousands of DIDs just sitting in their dashboard. At VoIP Innovations, we figured out a way to put a stop to the endless array of sitting DIDs. The solution was to create the My DID Groups section (see Fig. 1). This feature was designed to produce an overall more transparent view into DID usage, cost, and profit. Now let’s talk about what you can actually do with this new feature. 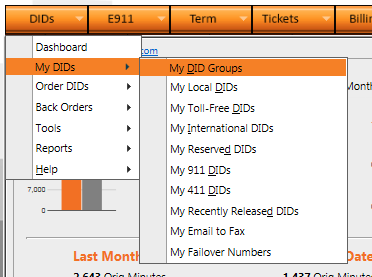 The reseller can create unlimited groups to better organize their DIDs. They select which DIDs they want to move and in one bulk action, they can send them to a new or existing group. Once a group is created, they can add notes to it. They can even figure out their gross profit and gross profit margins just by adding in their revenue (see Fig. 2). One of the best parts to this new feature is the key metrics it offers. If you look at the My DID Groups main page (see Fig. 3), you’ll be able to see the total metrics for each group. Once you’re inside a group (see Fig. 2), you’ll be able to see the individual DIDs and their respective usages and costs. We broke everything down into DIDs, DID MRC (Monthly Recurring Charges), E911, CNAM (caller ID), Fax to Email, Origination minutes, costs, and calls, Termination minutes, costs, and calls, and the overall total cost of each DID. This seems like it would make our resellers lives much easier, right? We thought so too, but we also thought we could take it just one step further. With the My DID Groups, the resellers now have the ability to see their key metrics from the month to date, BUT when the end of the month comes, the metrics start all over again. We added in an export function that allows the resellers to export the group contents as an excel spreadsheet or a CSV file. Resellers also have the option to look at past history by choosing a specific date range (see Fig. 2). VoIP Innovations is an Inc. 5000 company that specializes in providing the largest DID and termination VoIP footprints in North America. Their network includes over 500,000 DIDs in stock in over 8,500 rate centers in the US and Canada. Recently, VoIP Innovations expanded their footprint to include DIDs in over 60 countries and now offers A-Z termination. VoIP Innovations is owned by ABG Capital and is based in Pittsburgh, PA. To learn more about VoIP Innovations, visit their website at http://www.voipinnovations.com.